"We're not celebrating, we're honoring them. It's our responsibility." Yet another in a long line of direct-to-video thrillers, the MTV Films production Beneath fails to shock, or even entertain throughout its mercifully brief running time. The MTV brand often brings a decent-sized cast filled with young good-looking people, but here we have a heroine who simply doesn't fit the mold. So if you're expecting even the slightest bit of creepiness or atmospheric dread (which the cover art seems to suggest), you're spinning the wrong disc. Christy Wescot (Nora Zehetner) can't shake the horrible memory of being responsible at age 14 for a terrible car crash that severely burned and eventually claimed the life of her older sister, Vanessa (Carly Pope). When family friend Joseph (Don S. Davis) dies suddenly, Christy returns to her hometown and sees Vanessa's widower, John Locke (Matthew Settle) for the first time in years. She also runs into John's strange mother (Gabrielle Rose), as well as her friend Debbie (Nicola Anderson), but disturbing things start to happen when she meets her niece, Amy (Jessica Amlee). Usually when the opening titles begin with the Paramount Classics logo, one anticipates the work of a promising indie director. Unfortunately, the initial indie feel fades fast once the Paramount logo fades; once this story gets going, it becomes painfully obvious that this is a direct-to-video product wrapped in a credible production's clothing. The look of the film is bargain basement, the acting amateurish and pedestrian, and the direction is all over the place. Things are definitely not what they seem, but for all the wrong reasons. It's difficult to get emotionally involved in the plight of any character given the over-the-top performances that reduce nearly everyone to clich�s. Numerous scenes are unintentionally laugh-out-loud funny, including the climax, which also features some of the most generic special effects I've seen in years. When all is said and done, there's just nothing to lock the viewer in. The story wanders here and there, with a script so convoluted that everything seems to have been written on the fly. From the ridiculous opening car crash sequence to Christy's arrival back home, it doesn't take long to realize that this is just junk. Another flaw lies in the explicit manner in which every minute detail is spelled out for the audience via heavy-handed dialogue wherein even the grossly obvious is brought to attention. Unfortunately, the overall effect is so weak there's no chance to ever feel the willies. The icing on the cake comes during the last scene, when the ashes being scattered might as well be those of the movie's original negatives. Oh, but wait, the end credits actually roll backwards! Oooohhhhh, spooky! Image Transfer Review: The 1.78:1 anamorphic widescreen presentation is as lifeless as the film itself. The color scheme is incredibly drab and lifeless, with limited hues, yet no bleeding. Images are nicely detailed and sharp, and, fortunately, there are very few blemishes or flaws in the transfer. Audio Transfer Review: The audio is Dolby Digital 5.1, and it fares slightly better than the video transfer in that it does add a bit of life to the proceedings. Heavy on music and ambient noise, the track makes good use of the surrounds and exhibits a few directional effects as well. The horribly written dialogue is always crisp and easy to understand also. Extras Review: The only extras are previews for upcoming DVD releases. 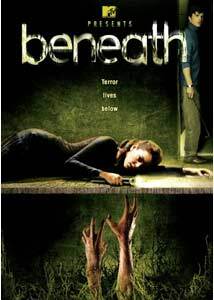 With a weak script and uninteresting cast, Beneath cannot hide its numerous flaws. Paramount's DVD release is bare bones, and, given how recent this production is, the audio and video quality is also disappointing.